Hastelloy C-276 bolting materials cover a variety of fasteners such as bolts, nuts, washers, screws, studs, and dowel pins. These bolting materials shall be made of ASTM B574 UNS N10276 rod. Especially, Hastelloy C276 bolts, cap screws, studs and nuts shall be manufactured to ASTM F467 and ASTM F468 under solution-annealed condition. 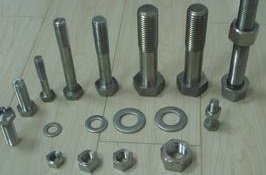 Hastelloy C-276 hex bolts with nuts and washer, ASME B574 Gr. N10276. According to ASME Boil and Pressure Vessel Code Section II Part D, Hastelloy C-276 bolting materials are not permitted by ASME Section III. However, it can be applied for ASME BPVC Section VIII Division 1 with maximum temperature limit of 1250°F, Section VIII Division 2 with maximum temperature limit of 800°F, as well as Section XII with maximum temperature limit of 650°F. Its maximum allowable stresses at elevated temperatures are listed in below table. *Temp. : metal temperature, unit: °F, not exceeding; *MAS: maximum allowable stress, unit: ksi.